ATAD has assembled a number of useful website links for you to explore if you, your son or daughter is considering an exchange experience in Rochester, NY. Note: Clicking on a link below will open the linked webpage in a new browser window. Council on Standards for International Educational Travel (CSIET): CSIET promotes international youth exchanges at the high-school level. CSIET’s mission is to provide leadership and support for the exchange and educational communities to ensure that youth are provided with safe and valuable international and cultural exchange experiences. Rochester, NY’s “Sister Cities” program: “Bringing the World a Little Closer” is the theme of the program. 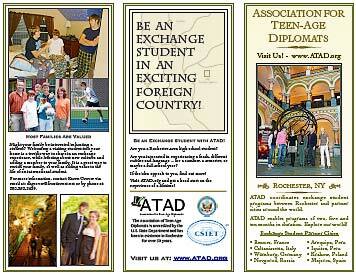 ATAD has been a partner with the City of Rochester since the sister city program’s inception in 1956. ATAD was actually founded 5 years prior to the City program’s initiation. Visit Rochester – This is Rochester, NY’s official tourism website. From sports and festivals to shopping and restaurants, there are so many reasons to visit the Rochester region! WikiTravel – Rochester – WikiTravel maintains an excellent wiki entry about the Rochester, NY area. From climate information to a history of the “Flour” (and Flower”) city, this is a well-rounded resource to explore. U.S. Dept. of State, Bureau of Educational and Cultural Affairs – Detailed information about cultural exchange programs of many kinds (year-long, short-term, high school, university, professionals, etc.) both for U.S. citizens looking to go abroad and for non-U.S. citizens looking to come to the United States. J-1 Visa Program – U.S. Department of State – Information on J-1 visas, the primary visa program for high school students coming to the U.S. J-1 visas are also in other international visitor programs (e.g., au pair, college, intern, and short-term summer/work programs).